Drepung Monastery (Wylie: ‘bras spungs dgon ),(literally “Rice Heap” monastery), located at the foot of Mount Gephel, is one of the “great three” Gelukpa university monasteries of Tibet. The other two are Ganden and Sera. Since the the 1950s, Drepung Monastery, along with its peers Ganden and Sera, have lost much of their independence and spiritual credibility in the eyes of Tibetans since they operate under the close watch of the Chinese security services. All three were reestablished in exile in the 1950s in Karnataka state in south India. Drepung and Ganden are in Mundgod and Sera is in Bylakuppe. 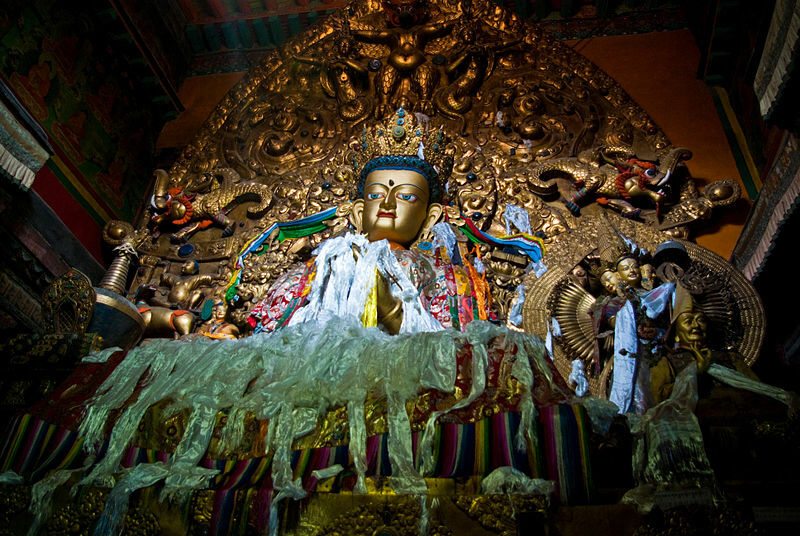 It was founded in 1416 by Jamyang Choge Tashi Palden (1397–1449), one of Tsongkhapa’s main disciples, and it was named after the sacred abode in South India of Shridhanyakataka. Drepung was the principal seat of the Gelugpa school and it retained the premier place amongst the four great Gelugpa monasteries. The Ganden Podang (dga´ ldan pho brang) in Drepung was the residence of the Dalai Lamas until the Great Fifth Dalai Lama constructed the Potala. Drepung was known for the high standards of its academic study, and was called the Nalanda of Tibet, a reference to the great Buddhist monastic university of India. Old records show that there were two centres of power in Drepung: the so-called lower chamber (Zimkhang ‘og ma)  associated with the Dalai Lamas-to-be, and the upper chamber (Zimkhang gong ma) associated with the descendants (future incarnations) of Panchen Sonam Drakpa, an illustrious teacher who died in 1554. The estate of the Dalai Lamas at Drepung monastery, called Ganden Phodrang, had been constructed in 1518 by Gendun Gyatso Palzangpo (1476–1541), retrospectively named and counted as 2nd Dalai Lama. Panchen Sönam Drakpa (1478-1554 CE) in 1535 succeeded Gendün Gyatso (1476–1541) on the Throne of Drepung, both of them being major figures in the history of the Geluk tradition. By the time Panchen Sönam Drakpa was appointed to the Throne of Drepung (Drepung Tri), he was already a famous Geluk master. He had already occupied the Throne of Ganden (Ganden Tripa) and was considered the most prolific and important Geluk thinker of his time. His successor was none other than Sönam Gyatso (1543-1588 CE), the lama who would receive the official title of the Third Dalai Lama (Talé Lama Kutreng Sumpa). Before his death in 1554, Panchen Sönam Drakpa established his own estate (Ladrang), the Upper Chamber (Zimkhang Gongma), which was named because of its location at the top of Drepung, just below the Ngakpa debating courtyard “Ngagpa Dratshang”. Tibetan Buddhist Resource Center attributes the following Name variants to Panchen Sönam Drakpa: “bsod nams grags pa [primaryName], paN chen bsod nams grags pa [title], khri 15 bsod nams grags pa [primaryTitle], rtses thang paN chen bsod nams grags pa [title], gzims khang gong ma 01 bsod nams grags pa [title], this last one referring to the Seat of the Upper Chamber established in 1554. According to TBRC his successors referring to the estate of the Zimkhang Gongma were Sonam Yeshe Wangpo (1556–92), Sonam Gelek Palzang (1594–1615) and Tulku Dragpa Gyaltsen (1619–1656) – closely connected to the famous story of Dorje Shugden. (Some say that Tulku Drakpa Gyeltsen was Panchen Sönam Drakpa’s second reincarnation, but usually he is considered to be the 4th incarnation of Panchen Sonam Dragpa ). It seems to be commonly accepted that Tulku Dragpa Gyaltsen was the fourth holder of the Zimkhang Gong ma incarnation line. According to Tibetan Buddhist Resource Center zimkhang gong ma Tulku Drakpa Gyeltsen has been his “primary Title”. Since the search for his reincarnation has been banned by the then Tibetan Govt, he has been the last one. The Tibetan Govt at the time of the 5th Dalai Lama and the 5th Dalai Lama’s ministers were jealous of the fame Tulku Drakpa Gyeltsen had. More came to recieve teachings and advice to Tulku Drakpa Gyeltsen than to the 5th Dalai Lama. This was threatening the rise in power of the Dalai Lama they thought and had tulku Drakpa Gyeltsen strangled with a scarf. Confiscated his Ladrang (Zimkhang Gong Ma) and banned Tulku Drapka Gyeltsen’s incarnation from being reinstalled. Tulku Drakpa Gyeltsen’s incarnation has been taking rebirth until now since the time of his murder over 350 years ago, but under other under incarnate lama’s names. There is a a Tulku Drakpa Gyeltsen incarnation currently, but is is under another name. He will continue to incarnate and do his works. Chapman reported that in the late 1930s Drepung was divided into four colleges, each housing monks from a different locality: “one being favoured by Khampas, another by Mongolians, and so on.” Each college was presided over by an abbot who had been appointed by the late 13th Dalai Lama. Drepung is now divided into what are known as the seven great colleges: Gomang (sGo-mang), Loseling (Blo-gsal gling), Deyang (bDe-dbyangs), Shagkor (Shag-skor), Gyelwa (rGyal-ba) or Tosamling (Thos-bsam gling), Dulwa (‘Dul-ba), and Ngagpa (sNgags-pa). It can be a somewhat useful analogy to think of Drepung as a university along the lines of Oxford or the Sorbonne in the Middle Ages, the various colleges having different emphases, teaching lineages, or traditional geographical affiliations. According to local sources, today the population at the monastery in Lhasa is about 300 monks, due to population capping enforced by the Chinese government. However, the institution has continued its tradition in exile with campuses in South India on land in Karnataka given to the Tibetan community in exile by Prime Minister Nehru. The monastery in India today houses over 5,000 celibate monks, with around 3,000 at Drepung Loseling and some 2,000 at Drepung Gomang. Hundreds of new monks are admitted each year, many of them refugees from Tibet. The Ganden-Phodrang-Palace situated at Drepung Monastery was constructed by the 2nd Dalai Lama in 1518  and declared his chief residence/governmental palace until the inauguration of Potala Palace by the 5th Dalai Lama. Drepung monastery was shut by Chinese authorities on 14 March 2008, after monk-led protests against Chinese rule turned violent and businesses, shops and vehicles were looted and torched. The PRC claims that 22 people were killed in the riots but Tibetan sources put the figure much higher. It was reopened in the last week of August after being shut for five months. 2.^ Tibet, Tibet: A Personal History of a Lost Land. Patrick French. (2003) Alfred A. Knopf. New York City, p.240 (in quote from 13th Dalai Lama). 3.^ Dialogues Tibetan Dialogues Han. Hannue. Quoting a monk at Drepung. 4.^ Chapman F. Spencer. Lhasa the Holy City, p. 195. Readers Union Ltd., London. 5.^ Dorje (1999), p. 113. 6.^ a b Dowman (1988), p. 67. 16.^ Chapman F. Spencer. Lhasa the Holy City, p. 198. Readers Union Ltd., London. This entry was posted on Saturday, January 28th, 2012 at 2:19 am	and is filed under Articles. You can follow any responses to this entry through the RSS 2.0 feed. You can leave a response, or trackback from your own site. This is a very in depth history not only of Drepung Monastery, but also for the history of Dorje Shugden. It allows all of us to know what has Tulku Drakpa Gyeltsen and his past incarnations have done for the Dharma and Je Tsongkapa. I am very happy that this information can be found on Wikipedia, it allows others to get information on both the Drepung Monastery and Dorje Shugden. They would be able to make a fair stand on whether or not Dorje Shugden is good or bad as this article is very neutral, not taking any sides of the ban.